Designed by field engineers with over 20 years experience, the FlowSIREN™ is the most innovative low power flow meter to hit the market in years. Low Power profile means longer battery life. The FlowSIREN™ data logger and wireless module operate using a very low power profile. Each version of monitor is designed allowing for a minimum of 1 and a half year battery life at 5 minute sample rate and one hour wireless upload interval. Less frequent wireless uploads extend a single battery pack up to three years. The FlowSIREN™ uses a 28 channel data logger including 8 analog, 8 digital, 4 pulse and 8 serial sensor possibilities. Sensor expansion is facilitated using the X-Port module. Designed using impact proof semi-rigid urethane resins ensures that your monitor will last while operating under standard and severe conditions. During the manufacturing process, air is extracted allowing the electronics to be fully encapsulated making the possibility of damage due to flooding next to impossible. No longer lose critical data due to flooding or surcharge conditions. Connectors are rated IP68 and made of parts that can not oxidise. 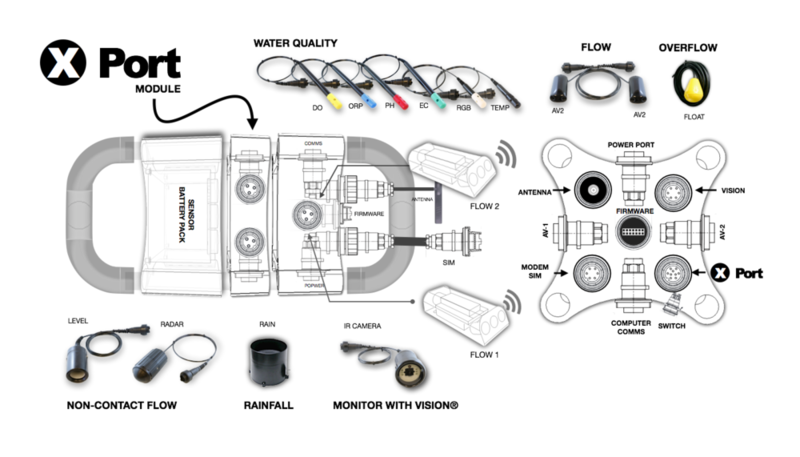 Multiple sensor ports allow you to connect depth, level, radar, velocity, water quality, cameras and rain gauge sensors. Two way communications allow you to trigger and reprogram the monitor remotely without having to go to site. Wireless antenna and SIM card ports are accessible via water proof chambers located on the top of the monitor. Program firmware using the external flash port, no access to the electronics is necessary.